Yesterday being the last Friday of the month of May it was time for another tea-and-cake event in the School of Mathematical and Physical Sciences. These provide an opportunity for staff to get together and chat while demolishing a specially-themed cake. The cakes themselves are organized by the inestimable Miss Lemon and I never know what the theme is before the goods arrive, so I have to ad lib a short introduction (for just a minute, without repetition, hesitation, deviation or repetition) before cutting the cake. As you will observe, this time the (Lemon Drizzle) cake was decorated with the Dirac Equation (which I consider to be the most beautiful equation in physics).. 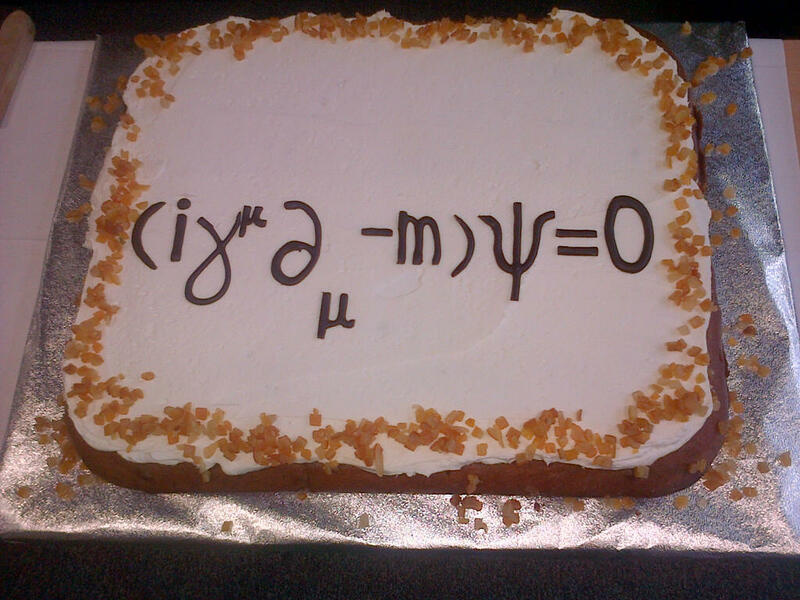 This entry was posted on May 31, 2014 at 1:59 pm and is filed under The Universe and Stuff with tags Cakes, Dirac equation, Physics, University of Sussex. You can follow any responses to this entry through the RSS 2.0 feed. You can leave a response, or trackback from your own site. I assume the cake was soon annihilated. Was there a corresponding anticake? An interesting application to the Icing model. Years ago at Berkeley, we had a cake for Joe Silk’s 50th birthday with a plot of the CMB angular power spectrum on it, including, of course, the Silk damping part.